22: 14-Aug-2017 | Blackwood Photographic Club of South Australia Inc. This weeks reading material is going to be an exposure to modern and quirky images just to get you thinking about seeing differently. First up, a great series of photos I found in the Guardian the other day. I posted it on our Facebook page, but lets have a look at them and see why they work. Our brains are good at pattern recognition and seeing pattern in simple structures. What do you see when you look at this? I would say that most of you said a face in the first two – and a horse to finish off. The ability to do this is called Apophenia – the ability to see connections or patterns in unrelated things. 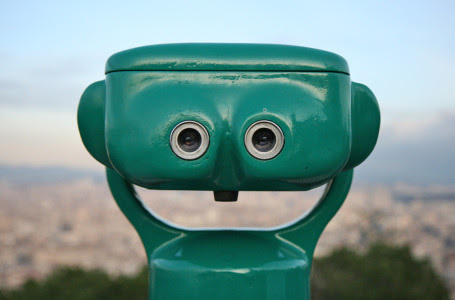 The ability to see those patterns as faces or familiar objects is referred to as Pareidolia (see also https://www.livescience.com/25448-pareidolia.html). The famous Rorschach Inkblot test is related to this. The phenomenon may be important when we consider our evolutionary roots in identifying threats and rewards although this is conjecture. Some consider it a survival tool. Whatever it is, our brains are very good at seeing these patterns as familiar objects and most of the people around us often see the same things. Now as photographers we spend a lot of our time capturing interesting subjects. The problem is that we take the same shots every time – the flowers, the animals (furry and feathered), the landscape (building or natural), the same old stuff. But there is a richer world of patterns and forms around us we ignore and we should stretch ourselves. I know I spend a lot of my time seeing things and thinking is it worth taking shot. I look up at buildings facades and see the old building behind the glitzy modern frontage. I see patterns in the environment around me too but often will not capture it – guilty! So here is my challenge for you (and me) – try and capture the pattern you see that represent faces or familiar objects. Do it for a month and see if it improves your photography as you look for new things! You may be surprised. To finish off in my continuing battle to widen your photographic horizons here are some examples of contemporary and famous photographers you should look at – and get out of that rut! First an example of 15 Famous Contemporary Photographers in Photo Traces – I find most of them fascinating, and in reality very simple images that we can all learn from. Have a look at these quotes from famous photographers too – that will get you thinking about what you photograph. Taking that one step fuirther Jasper Tejano in Lens Culture has a photo essay that draws inspiration from the photographic greats that capture the decisive moment (that’s a famous Cartier-Bresson quote) with his own view. As a follower of Street Photography I find these very inspiring. And finally, for a bit of a different interpretation of night photography, this essay in Feature Shoot by Ellyn Kail featuring the work of Daniel Soares looks at lonely people at night in New York. It is a moody but fascinating look at the late night world.